Disadvantaged rural communities are disproportionately exposed to drinking water risks in California. Too many experience insecure supplies and contamination of their water sources. While there are growing efforts by policymakers to address water contamination, many communities will need further help to prepare for future droughts. Improved planning efforts could help avert water shortages. 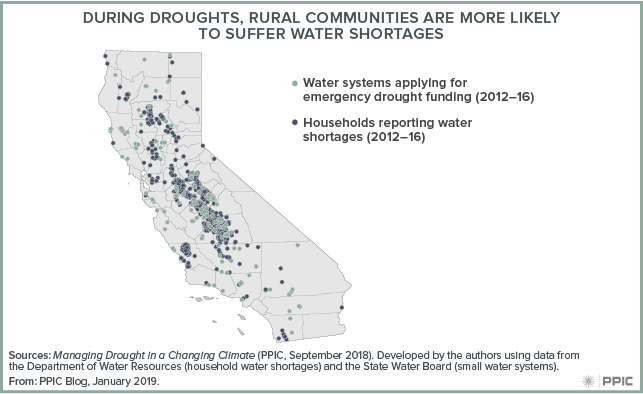 Rural residents are more vulnerable to running out of water during droughts because they are more likely to rely solely on groundwater from small community wells or domestic wells. These wells tend to be relatively shallow, so they are susceptible to running dry when pumping lowers groundwater levels. During the 2012‒16 drought, farmers and cities pumped extra groundwater to make up for surface water shortages. Thousands of wells went dry―mostly domestic drinking water wells in rural communities, especially in the San Joaquin Valley. And roughly 150 small community water systems sought emergency assistance to keep the taps flowing. Although the state’s Sustainable Groundwater Management Act (SGMA) is expected to lead to balanced groundwater use and reduce over-pumping in the long term, California’s highly variable climate means that groundwater levels will still drop during droughts. This could result in more drinking water wells going dry. In a recent submission to the California Water Data Challenge, several colleagues from UC Davis and I found that a drought similar to the latest one could cause more than 4,000 domestic wells to go dry in the Central Valley. Develop drinking water plans for rural communities and identify durable funding sources. Small rural systems do not have the financial capacity for drought planning and mitigation. State and local partners should use their experience from the recent drought to identify communities at highest risk, connect them to larger systems where feasible, and devise drought response programs for the others with reliable funding sources. The newly formed groundwater sustainability agencies, working with local partners such as counties and agricultural and urban dischargers, could help coordinate actions and streamline funding mechanisms. Ensure groundwater sustainability plans include mitigation actions for dry drinking wells. Sustainability plans should describe preparation for groundwater drawdowns during severe drought similar to the one in 2012‒16. For instance, as groundwater sustainability agencies develop their plans, mapping drinking water wells that might be at risk for different drought scenarios and proposing mitigation actions that proactively decrease the risks are both imperative. Studies of institutional responses to the latest drought largely find that planning for drought response and recovery paid off. Making an action plan to avoid further water-supply risks in disadvantaged rural communities―as well as identifying reliable funding mechanisms to implement it―should be top priorities for California policymakers.